Hyundai Genesis Sedan Named a "Best New Model" in Kiplinger's Personal Finance. Hyundai’s luxury flagship Genesis sedan recently was named a “Best New Model” in the “Sedans $30,000 - $45,000” category by Kiplinger’s Personal Finance. 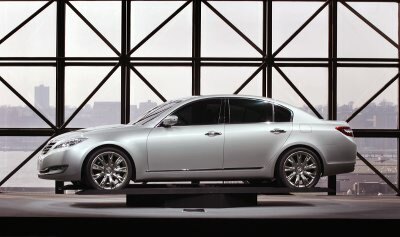 The magazine named the top new models in 11 categories and Genesis sedan topped competitors such as the Acura TL, Audi A4 and Nissan Maxima to earn the distinction. The top models in each category represent the best values based on Kiplinger’s ranking system. Kiplinger’s editors sort the new 2009 models by price and category then pit them against their peers, looking at performance, value, safety, roominess and driving impressions. Hyundai’s new Genesis sedan sets a new benchmark in the premium car category. With a starting price of just $33,000, Genesis includes performance and luxury features typically found on vehicles costing thousands of dollars more. In addition to great features, Hyundai's generous 10-year, 100,000-mile warranty, numerous standard features, good reliability and affordable price made the Genesis a clear winner for Kiplinger’s editors. Other notable features include a quiet and luxurious cabin, V-6 and V-8 engines that are more powerful and efficient than many in competing models, and a smooth, responsive six-speed automatic transmission.